Alaab Alcomputtar (مَجَلّة أَلْعَاب الكُمْبِيُوتَر) is the first ever videogame magazine originating from the Middle East. It covers games from all systems. 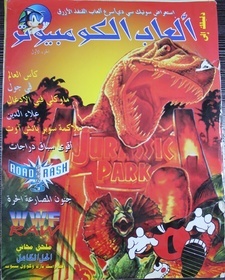 Magazine started in the mid 1990’s and ended in 2011 and was one of the three completely original Arabic magazine and was the most popular one. The issues were split into section. The first was Hot News (الأَخْبَار السَّاخِنَة) which delved into the most anticipated and biggest games coming plus some big gaming news. The second section was First Preview (أَوَّل نَظْرَة ) were they give points (negative or positive) to a game from the available information. The next section was Reviews (إِسْتِعْرَاض) were they give a score to a specific game, this section was always 4 pages and sometimes there was a bonus section after the third one were they give full walkthroughs for games. The final section is Secret Service (الخَدْمَة السِّرِّيَة) were they put Secrets and Easter Eggs. In early issues, there was an Anime section (رُكْن التَّسْلِيَة) were they tell an Anime’s story in a form of a novel. This section was replaced with Readers Choices (مُخْتَارَات القُرَّاء) were readers could submit there reviews of a game and give them a final score. In the end of every issue was a small comic that was drawn by readers. In every issue there was a section called The Golden Rules For Smart Players (الوَصَايَا الذَّهَبِيَّة لِلاعِب الذَّكِي).It was used to teach kids good Islamic morals like not forgetting to pray, some were more normal like not to forget to do your homework or not to replace reading or exercising with videogames. Although this structure stayed mostly the same except in the first issue, towards the end the magazine, it turned into only full walkthroughs. A comic called "Batal Abu Hazim"